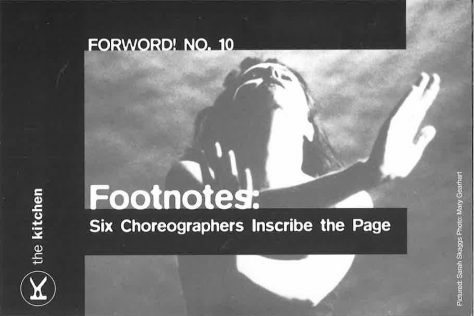 Footnotes: Six Choreographers Inscribe the Page,was part of the ongoing Kitchen series, ‘ForWord! No.10. This event celebrated the publication of the eponymous anthology edited by poet, writer, and performance artist Elena Alexander that compiled writing by choreographers Douglas Dunn, Marjorie Gamso, Ishmael Houston-Jones, Kenneth King, Yvonne Meier, and Sarah Skaggs. For this event, the choreographers were asked to approach writing as an act itself, rather than an illustration of their principles. The choreographers read texts by Jean Baudrillaud, Kenneth King, Anne Sexton, Robert Creeley, Vladimir Mayakovsky, and Pink Floyd, followed by a commentary by Elena Alexander.